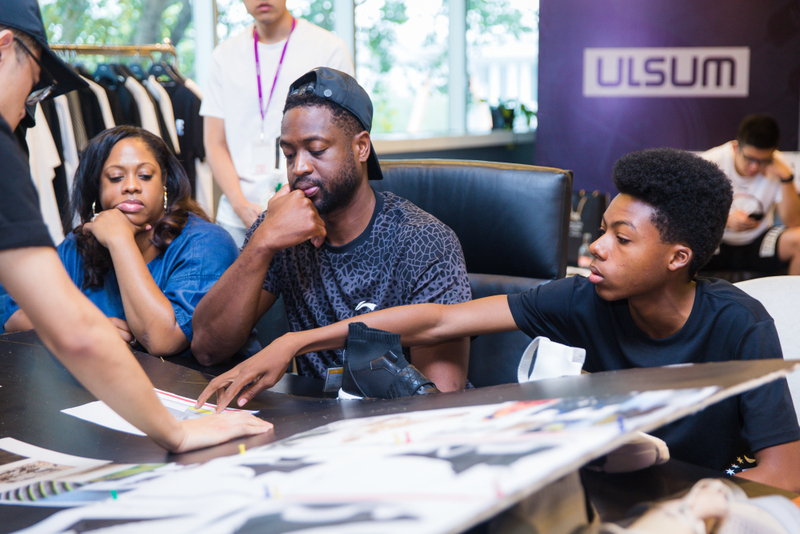 CHICAGO — Dwyane Wade is sitting in a conference room at the Li Ning Campus in China. Spread out in front of him are designs for his next round of shoes. He turns to the young man standing behind him. “I don’t know …” Tubuka Evans says quietly. The tall, thin teenager is dressed in Dwyane Wade-branded clothing. Sitting next to Wade is his trusted stylist, Calyann Barnett, and other members of Team Wade. “Speak up, man.” Wade says. Everyone in the room looks to Tubuka, then at Wade. They wait for his reaction. A smile spreads across Wade’s face as Evans explains what is wrong with the design. This is a bold move for the 17-year-old. He knows Wade himself designed these shoes. But soon enough one of the most famous — and fashion-savvy — basketball players in the world is agreeing with Evans. The design is wrong. It won’t sell to teenagers, one of Wade’s key markets. Wade decides to ask his designers to make the changes Evans suggests. 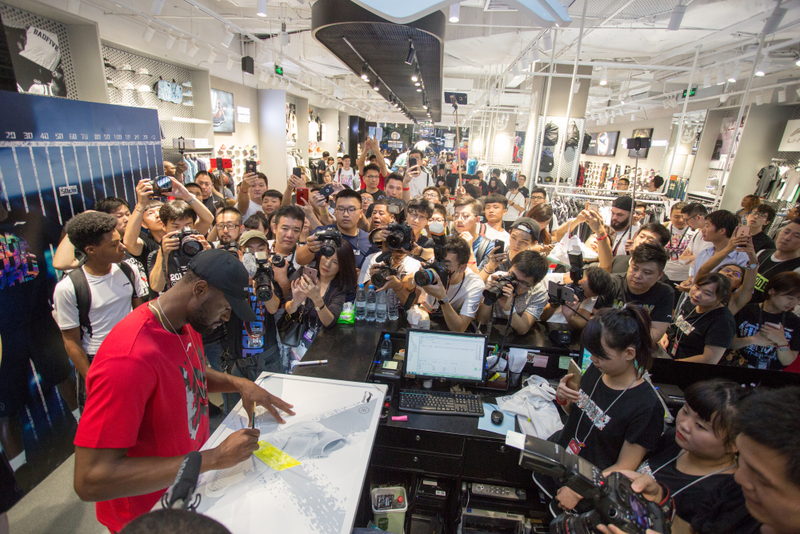 Evans spent six days in July with Wade and his team in China to learn about the shoe design business. Wade had identified him at an event for Chicago kids, and brought him on the trip as part of his Spotlight On initiative, which seeks to elevate students from the most disadvantaged parts of Wade’s hometown. It was a perfect fit: Evans dreams of designing shoes for a living. He already runs his own company offering custom designs painted onto shoes and purses. He has a website and a LinkedIn page. But like many young Chicagoans, he’s moved homes and schools. He struggled with grades his junior year. He has an entrepreneurial spirit but needed the right boost to build the life he wants. As soon as Evans returned from China, I invited him to meet at the Art Institute of Chicago, the giant museum on Michigan Avenue in the heart of the area the city loves to show off. Even if you haven’t been to Chicago, you’ve seen the giant stone lions dressed in one sports jersey or another. We picked a date in late July. We meet at the modern wing entrance, a giant room with soaring ceilings allowing every ray of natural light to shine through. Because I’m here to observe Evans and learn more about his artistic sensibilities, I wait to see where he leads us. “What’s your favorite exhibit?” I ask. Too proud to grab a map, I start an impromptu tour. His passion for art is plain from the moment we step into the American art section. He is instantly drawn to The Rock by Peter Blume, a painting showing a partially destroyed rock with remnants of the world strewn about it. “Look at this one! It has black people in it,” Evans says. We walk up to Nightlife, painted by Archibald Motley in 1918. According to the Art Institute of Chicago, Motley’s work was meant to capture the vibrancy and vitality of African-Americans during the Jazz Age. Evans examines it closely, then moves on to the next piece. He is hungry to take in each painting, sculpture, tapestry. His eyes move quickly over the works, moving in as closely as the guards will allow. He stares at the tiniest details, like a broken Coke bottle in the Blume painting, or the brush strokes and stains in Mark Rothko’s work. Back in the modern wing, the newest part of the museum, Evans is captivated. Evans has often been inspired by other artists; one of his paintings is based off of Kanye West’s The Life of Pablo. So Warhol and Roy Lichtenstein’s pop art — and the idea of artists shaping each other from afar — appeal to Evans. After lunch, Evans and I sit in Millennium Park, known for fountains and the Bean, that huge silver sculpture every tourist seems required to look into for a picture. Evans explains to me how he found himself in China, his life forever altered by an NBA player who a few months prior was just a name, a vague reference he heard other kids in school make. He originally met Wade by chance, in mid-March. Walking down the hallway at Gary Comer Prep, Evans was stopped by Vondale Singleton, the school’s assistant principal. Singleton was bringing a group of students to an event sponsored by Wade. Students who were interested in fashion would hear from people working in different jobs in the industry. One of Singleton’s confirmed students dropped out. Did he want to go? “Of course I want to go. I’m a fashion guy. That’s my business. I’m a shoe designer,” Evans told Singleton, who was previously unaware of those business aspirations. When the panel — which included Wade’s stylist Barnett, a buyer for Tie Bar and a fashion professor — finished talking, they asked for questions. One hand shot up. It was Evans’. They answered his question, then asked the group for another one. The room stayed quiet. Evans looked around, and then put his hand up again. This pattern repeated until other students in the room started to raise their hands. Wade, standing in the back of the room, nodded and smiled to see Evans so eager about this chance to learn the industry. And that’s how Wade came to notice the young man who wasn’t even supposed to be at Bucketfeet that day. The two talked at the event, and Wade took Evans’s business card, printed out the night before. Wade invited Evans to his fashion show a few days later, and Evans made his mark when he fixed the virtual reality equipment on-site. The tony event showed off Wade’s Dsquared2 clothing collection and benefitted his foundation. Evans met Wade’s wife, actress Gabrielle Union, and she put him on Facebook live. While his classmates noticed him on her feed, he noticed the way the couple interacts. “They’re both really open. They’re like the best couple I’ve ever met. They bring out the best in each other. She’ll give him a look and he’ll get it,” Evans says. So Evans speaks steadily as he recounts the days that led to him meeting Wade. When he had a more stable home life, Evans still lived in Englewood and the 100s (sometimes called the Wild 100s), Chicago neighborhoods well-known for violence and poverty. Evans says his father died before he was born, and he, his mother and sisters moved around often. Wade’s time with the Bulls was short. He’s been using his wealth to impact Chicagoans from the beginning of his career, though, and because he grew up here, and still has family here, he knows the people of Chicago well. Through donating new gym floors and uniforms to his high school, yearly basketball camps, and bringing more than a dozen outstanding Chicago teenagers to be recognized at Bulls game, Wade has met many young Chicagoans. From the moment Wade came into contact with Evans, he recognized his potential. Wade’s Spotlight On initiative began last fall with events and announcements recognizing students at Bulls games, and by sponsoring educational nights like the one where he met Evans. The program — which he has said will continue to operate in Chicago — has grown and endeavors to give students opportunities in the careers they dream of entering. A teenager who wants to be on the radio spent a day with Angela Lee, the host of the national morning radio show the Breakfast Club. Another who dreams of becoming a police officer will spend a day with the Chicago Police Department as they handle security for an event. Wade is also backing programs with his wallet. He recently donated $100,000 more to fund Pitch Black, an initiative engaging high school students to find solutions to problems facing Chicagoans. He also gave Evans plenty of clothing and shoes, and bought him all the art supplies he could need. Evans has spent most of his life on the south side of Chicago, but changed schools his senior year to one on the west side. Despite switching schools, he’s still in contact with Singleton, who says the visit to China has had a lasting impact. Evans is dedicated to making money from his work. He takes seemingly used-up items and turns them into art. He paints shoes given to him by clients. He prefers to spend time with the shoe owners to figure out what design fits them. He’s still taking popsicle sticks and turning them into homes, adding details like miniature paintings. While art is his passion, business drives him. He dreams of attending the School of the Art Institute, and of becoming an architect. He finds joy in walking miles through Chicago, an architectural dream that was home to Frank Lloyd Wright, Louis Sullivan and Mies van der Rohe. “What I want to build first is an art gallery to show off my shoes. I want people to walk into my studio and see my shoes first, and then see a really big painting in the middle, on a glass wall. Everything that’s in the room is art,” he tells me. So a chance meeting with a school administrator turned into slipping his business card to Dwyane Wade, and that helped him turn hard work at a fashion show into a trip to China. That trip wasn’t all business. Evans — who was chaperoned by Singleton — also got a chance to face a fear while seeing the Great Wall of China. “I was very afraid of heights. I was having all these freak attacks, randomly, as we were going down. I would sit down and start sliding down the steps, and I couldn’t move for a few minutes,” Evans said. He sat on a ledge, contemplating standing up to see the view everyone kept talking about. He found himself stiffened up, unable to stand.